"Known in Italian as 'Risotto con Zucca i Fagioli.' 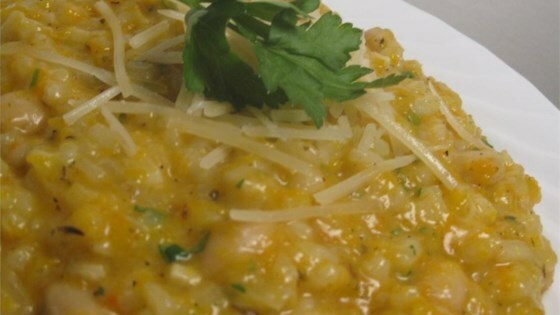 Steamed butternut squash folded into a creamy white bean risotto is the perfect flavorful dish for a weeknight or entertaining your favorite guests." Season butternut squash cubes with salt and black pepper. Place a steamer insert into a saucepan and fill with water to just below the bottom of the steamer. Cover and bring the water to a boil. Add butternut squash, cover, and steam until just tender, 10 to 12 minutes depending on thickness. Transfer squash to a bowl and mash. Heat olive oil in a skillet over medium heat. Cook and stir onion in the hot oil until softened, 3 to 5 minutes. Stir tomato into onions until onions become translucent, 3 to 5 more minutes. Add Arborio rice to onion mixture and stir to coat with oil; cook and stir until rice becomes translucent with a white spots in the middle of each grain, about 2 minutes. Stir white wine into rice mixture; cook and stir until wine is completely absorbed, 2 to 4 minutes; add marjoram, oregano, and basil. Pour chicken broth into rice mixture, about 1/2 cup at a time, stirring until liquid is absorbed, until rice is creamy but firm to the bite, 20 to 25 minutes. Stir squash into rice mixture until fully incorporated. Remove from heat. Stir hot pepper sauce, white beans, Parmesan cheese, and parsley into risotto until cheese is melted. Season with salt and black pepper. Make a creamy risotto with naturally sweet butternut squash. To cube a butternut squash, cut it in half lengthwise, then into 1-inch sections crosswise. Carefully shave the peel off in small downward cuts around each section, then cube. Its a lot of work. But it was good. Also it makes a lot of it. I cut it in half and it still made a lot.